If you thought the legend-based slot Thunderstruck 2 from Microgaming had the Norse angle sewn up, think again. The world of Vikings and Norse warriors is one that lends itself well to online slots, with its mix of war, action, adventure, and massive blokes in beards and helmets. Online slot developer Microgaming’s other slot inspired by the world of the ice and snow is Arctic Fortune, and it’s obvious that the developer like the cut of their Norse jib. Cranking things up with a 1024-ways-to-win system – although betting is still available at the lower end of the spectrum - the 5 reel slot sees you amidst a band of marauding Vikings ploughing through the sea en route to another weekend of pillage and drinking (minus the football). The Vikings have obviously taken the ice and snow with them, as the reels are full of it. Elsewhere there are long ships, treasure chests, wine, husky dogs, plus the Vikings themselves and the Viking wives. There’s some neat animation whenever a winning combo is formed with a suitably dramatic soundtrack played in the background during play. The Arctic Fortune logo acts as the game’s Wild, and only appears on reels 2, 3 and 4, substituting when it does for all regular symbols. Remember, this is a 1024-ways-to-win game, so you can still be in for some big wins despite the relatively stingy Wild reels. As you’d expect the Treasure Chest icon triggers the bonus round when you hit three or more on the reels. A very nice bonus round follows - and it comes in stages. First your Viking chum has to shoot spiders with his bow and arrow. With each hit you’ll get free spins or a multiplier. Next up, hit the larger spider on the head to win cash, and finally hit the door hinges to make it come down on the beast once and for all. The better you do, the more spins you’ll receive – in fact, up to 40 spins with a 6x multiplier can be yours, meaning that in terms of bonus offers, Arctic Fortune is right up there. 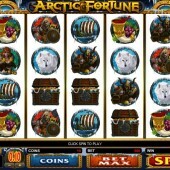 Arctic Fortune may not be for the faint-hearted – you’ll certainly need at least a moderately-sized bankroll to enjoy the game to its full – but the potential rewards are massive, especially if you hit the free spins head-on. 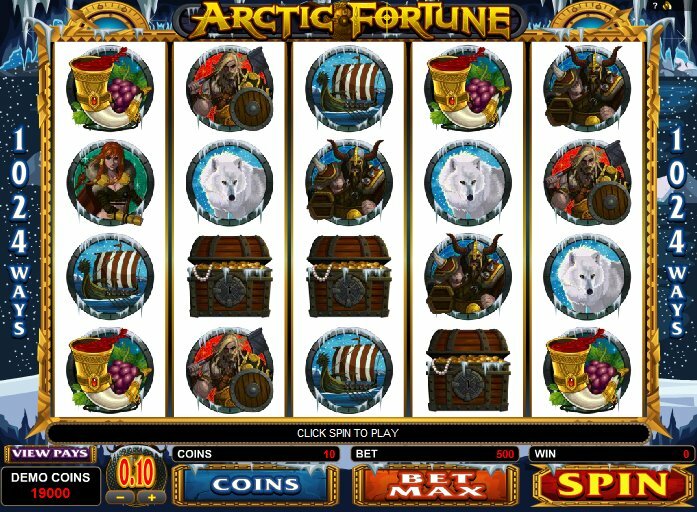 While popular slots such as Thunderstruck and Thunderstruck 2 are the flagships for Norse magic among slots lore, Arctic Fortune certainly is staking a claim to be mentioned in the same breath as those two behemoths. However, Betsoft Gaming’s Norse-themed Viking Age, with its lush graphics and generous bonus offers, is a worthy alternative.